In an adventurous programming gambit Friday night, the Cantata Singers and Ensemble under David Hoose matched up two opposites—Johann Sebastian Bach and Anton Webern—and concluded with the monumental Brahms Requiem—all impeccably rendered. The near-capacity Jordan Hall audience sat rapt for the hour-long German Requiem and burst into a standing ovation after a long climactic sigh. The 53 singers, the full orchestra and Hoose himself, looked spent as they took their bows. Hoose is known for his creative programming (he calls the process “exhilarating”) and explained himself in his thoughtful program notes. He seeks to combine pieces that “suggest vital interactions, dynamic relationships”. He also likes to surprise his audience. And so opening the evening with the rarely heard Webern orchestration of the Fuga a 6 voci, the Ricercare, from Bach’s The Musical Offering (BWV 1079) met his criteria. Webern composed this homage in 1934-35, nearly 200 years after the original and managed to inject modern tonalities without losing the Bach feel. Indeed, Webern did not tamper with Bach’s notes; the orchestration rather takes the original as a point of departure. Under Hoose, the orchestra sometimes achieved the tone colors of an organ, employing muted brass and lower strings to hold back the dissonance. From the Webern arrangement, the program moved on the pure Bach, Cantata BWV 60, O Ewigkeit, du Donnerwort (O Eternity, You Word of Thunder). The texts purports to be a dialogue between fear and hope, with the alto representing fear and the tenor hope. Regrettably the rich alto of Lynn Torgove was almost totally drowned out by the orchestra. Tenor Eric Christopher Perry shined through impressively. The dialogue contrasts opposite attitudes. Torgove sang of “the fear of death, the last pain,” while Perry replied that “the fire of suffering is hot but so be it! It purifies me to the praise of God.” Following four solo-dominated sections, the full chorale surged forth in a magical moment that blended with the orchestra precisely. The show then swung back to modernism, this time displaying Webern at his most radical. Five Movements for String Orchestra, op. 5b, brought a fresh collection of short atonal pieces—some a few minutes long—with delicate pluckings and high-register strings. The ensemble produced what Webern apparently strived to create: seemingly fragmentary passages that reward an attentive listener with linked phrases of rarefied beauty. In this interpretation, the orchestra seemed to exists as accompanist to the glorious soprano solo work by Majie Zeller and the even more captivating bass of Mark Andrew Cleveland. The markings of the seven sections range from “slowly with feeling” and “march character” to “briskly” and finally “solemnly”. At the end of each section, Hoose brought the orchestra and chorus to full power to dramatize the Biblical texts chosen personally by the composer. Of particular note Friday night: four members of the well-remembered Emmanuel Wind Quintet—conductor Hoose, the horn player in EWQ, flutist Christopher Krueger, oboist Peggy Pearson, and clarinetist Bruce Creditor—performed together in this concert, 35 years after winning the Naumburg Award in Chamber Music. 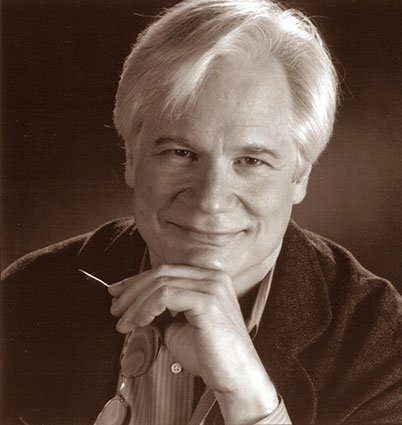 Michael Johnson is a former Moscow correspondent who has written on music for the International New York Times, Clavier Companion, and other publications. He divides his time between Bordeaux and Brookline.